The Jurisdictional Officers are pleased to present an incredible Membership Drive for your Chapters. 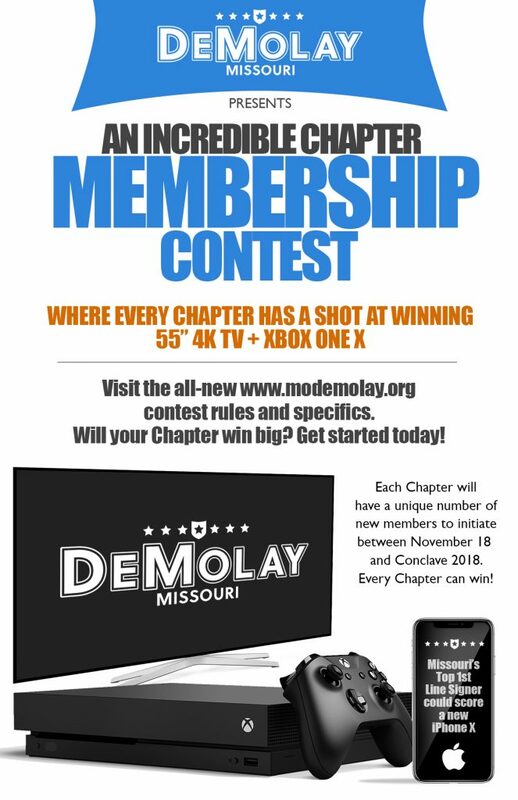 Beginning Saturday, November 18, 2017 and running until Conclave 2018, your Chapter has a shot at winning a 55″ 4K TV and an Xbox One X for sharing the DeMolay experience with others! Each Chapter has a unique number of new members to recruit to earn the Tier 1 prize (55″ 4K TV). PLUS…if your Chapter initiates at least 10 members over the Tier 1 goal, the Chapter will receive an Xbox One X. But wait… there’s more! For the individual that first-line signs the most new members between now and Conclave 2018 will win an iPhone X!